Freir is a Nord priestess at the Temple of the Divines in Solitude. Her husband is Rorlund, the high priest of the Eight Divines. If you visit the Temple, she will extend an invitation to pray at the shrines and seek the blessing of the Divines. 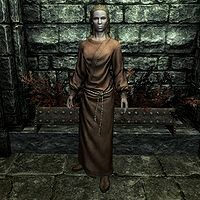 If questioned about the empty alcove in the Temple, she will explain that it used to have a Shrine of Talos until the worship of Talos was banned by the White-Gold Concordat. If the Stormcloaks take over Solitude, she will change her dialogue to say "Nine Divines" instead of "Eight Divines". She wakes at 6am and starts working as the temple minister, tending the shrines for twelve hours. At 6pm, she finishes working and wanders around the place until 12am, when she heads to bed. Freir wears a set of monk robes along with a pair of boots. She carries a belted tunic along with a selection of common items and gold. When you are near her, she can be found saying things like: "Blessings of the Eight/Nine Divines upon you. How may I help? ", "You look troubled. Have you come seeking guidance? ", and "Feel free to take a seat, or pray at the shrines. We appreciate worship in all its forms." Upon ending conversation with her, she may tell you: "The strong and honorable always carry the blessing of the Eight/Nine." or "Your rewards in life will match the strength of your faith." While she is working as minister, she will pray with: "May knowledge of your Divinity carry us through our daily trials. ", "Remind us of our place, when we forget." or "Let us walk in the steps of the Divines." She shares this dialogue with Greta, Silana Petreia, and Rorlund. Asking her what the shrines do will have her explain, "Those who worship at the shrines will sometimes receive boons from the gods themselves. The nature of the favors varies per deity. Please, feel free to worship at any or all of the shrines." If Solitude is under control of the Imperial Legion, you can mention to Freir that one of the alcoves up front is empty. She'll reply, "Hmm? Ah, yes. That once held the shrine to Talos. But the worship of Talos was banned by the White-Gold Concordat, some time ago." If you ask her what the White-Gold Concordat is she will reluctantly tell you, "It's the peace treaty that ended the war with the Elves of the Aldmeri Dominion. The Dominion recognized the heresy of proclaiming Talos a god. Talos was a great man, and a great Emperor... but that does not make him a god. No matter how much the Stormcloaks may wish it were so." Freir: "Certainly, acolyte. What troubles you?" Silana: "I know you and father Rorlund have many duties to attend to in the temple, but sometimes I feel that there are more important matters to attend to." Freir: "What could be more important than hearing the prayers of the faithful, and answering the questions of the dedicated?" Silana: "Mistress, the people of Solitude are destitute. Many are starving and desperate for work. We need to be more active, to reach out to them." Freir: "We took you in, didn't we? We would be glad to extend our welcome to any other who showed your dedication. What more could we do?" Silana: "I know, and I appreciate it dearly. But I can't help but feel we could be doing more..."
Freir: "Kynareth has blessed you with tremendous compassion, Silana. You will find a way, I'm sure of it." Rorlund: "A word, my love?" Freir: "What troubles you, darling?" Rorlund: "I fear attendance is down. There are so few worshippers coming to see us. Could it be that the war has weakened their faith?" Freir: "Nonsense, dear. I've had more visitors than ever seeking the wisdom of the hearth goddesses." Rorlund: "Ah, that must be it. So many of the men are serving in battle. I shall pray to Stendarr that they return victorious." This page was last modified on 25 January 2014, at 18:42.